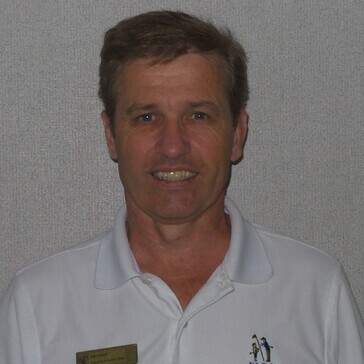 Chris has been a Golf Professional for over 30 years. He started as an apprentice in the Canadian Professional Golfers Association, eventually becoming a fully certiﬁed class “A” CPGA Golf Professional. Chris has been a PGA of America Golf Professional for over 20 years. Chris has always been an innovative teacher and very creative with his approach to developing the skills of his students. For a short time, Chris lived in Tampa, Florida. With his ever growing “tour bag” of game improvement training tools, he was noticed again by a local sports writer and the subject of another article. “Golf Pro Offers Unique Training Tips”, The Laker newspaper. Chris went back to the New York area after a couple of years in Florida. Shortly after arriving back, he started work as the Lead Golf Instructor at Alpine Golf and Country Club in Demarest, New Jersey. While working at Alpine, a writer for Golf Pro Magazine, a New York based golf industry magazine, heard of Chris and wrote an article titled "Young Einstein" - that title says it all. During his tenure at Alpine Golf Club, Chris was nominated six times for New Jersey PGA Teacher of the Year and twice for Golf Magazine’s Top 100 Teachers. Although, very busy with his teaching schedule, Chris found time to also be a contributing editor for Golf Tips and Golf Illustrated magazines. One of his articles was on how to build your own golf training tools for the "off season." Another was titled “Tale of Two Planes” and was voted the best full swing article of the year for 2000 and was featured in the ﬁrst Golf Tips: Instructional Annual. (November 2014 & January 2015) and in turn, helping his fellow golf professionals with their ‘craft'. Chris is a welcome addition to the Royce Brook Golf Academy and we wish him well in his ﬁrst year. For more information on Chris, you can click on the following ‘link’ to visit his website at: www.cjohnstonpga.com " While on his website, you will learn more about Chris and his teaching philosophy, along with reading testimonials and seeing student transformation, ‘before’ and ‘after’ photos.